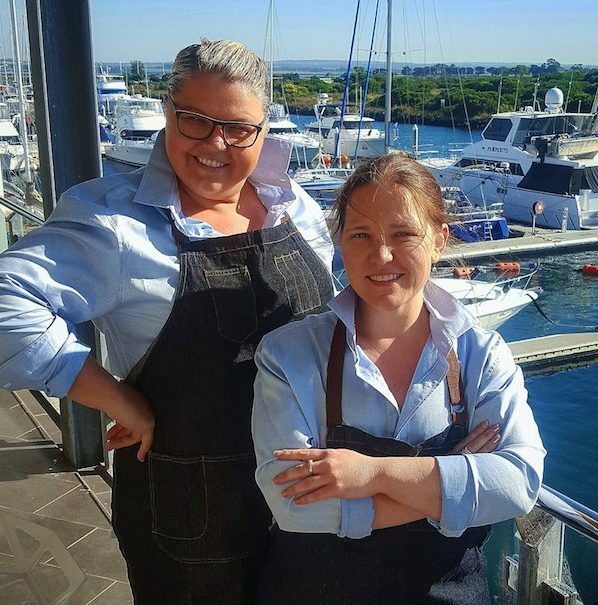 Cheeky, quick-witted and deadly with an egg beater, Kylie Iddles, pictured left, and Brooke Glover may be the funniest pair you’re ever likely to meet in a kitchen. They are the backbone of 360Q and work hard each day to fulfil their catchphrase: “Just a couplamums getting it done.” They don’t often get to meet our guests but, considering almost nothing is off limits in their hilarious banter, you’d be more than entertained if you did! Here we have a few chats with the pair to get all the gossip. Click here to read part one of their hilarious Q&A! Brooke: It’s been around 13 years. Almost as long as I’ve been married – except Kylie and I have never had an argument! And I don’t have to do her washing. Kylie: Chook and I have worked in between her birthing her three sons for about 13 years – she was a lot taller then! We’re like a well-oiled old married couple. We finishing off each other’s sentences and the like. What are your roles here at 360Q? Brooke: We are the self proclaimed ‘prep queens’. We may also be considered for the roles of comedy queens and umm, drama queens? Kylie: We have no set role per se. We would describe ourselves as prepatory queens. We get stuff done. We’re not afraid to get in amongst it in the name of attaining goals. For us mums it’s a challenge, but one we enjoy accepting as the reward is as satisfying as baby’s burps after a bottle! Brooke: We’re so lucky that we get to do something different every day. There’s always a new function to prepare for and the 360Q menu changes regularly. We have a clipboard meeting, get our to-do list and off we go! We talk a lot but our hands never stop moving! Kylie: We’re very special. It’s taken years to reach our level of special in that every day is filled with something new. It might be a new menu item Barry has concocted for us to decipher – that’s quite a challenge in itself really. However as mothers we are mind readers and the end result is always praised. Or I just spend the day gazing out the window describing the beautiful bay views at 360Q from our kitchen window to Brooke (as she’s vertically challenged) whilst baking like a pair of CWA ladies who have eaten too many lamingtons in one sesh! You call yourselves a ‘couplamums’ and have a catchphrase, “couplamums getting it done”– how did that become a thing? Brooke: We have always been upfront about not being classically trained chefs. We are just a couple of mums who love food and flavour and we cook with love. Being a mum requires military-precision organisational skills. Plus, being a mum also requires you to roll up your sleeves and get stuck into the day ahead. #couplamums #gettinitdone became our motto and sometimes it’s a good motivational tool – the kitchen version of “Aussie Aussie Aussie oi oi oi”. On a serious note, we have learned that not everyone who tries hospitality has that #gettinitdone attitude. Kylie: ‘Couple mums’ and then ‘couple mums getting it done’ came from working with such a vast demographic of chefs. You meet them all. The great ones, the inspirational ones, the ones that are still at Woodstock in their minds, and the ones who drink copious amounts of Woodstock. So in saying ‘a couple mums’ it simply defines us as just that! We don’t claim nor do we want to be Michelin-starred or tweezer chefs. We’re just two mums who pop on a ferry to get things done at one port and then pop back on the ferry to go home and smash out dinner, laundry, ironing (that’s Brooke, not me), maybe have a Milo over a Donna Hay and a bit of Law & Order. We just get whatever we have to do done without acclaim, applause, medals or fortune (although we do tell each other at the end of the day how great we’ve been!). Brooke: I have three gorgeous little boys. Kylie has been there with me (not literally, there’s some things you can’t unsee, hey?) for all their births. They are the fussiest eaters in the history of the world. They don’t like my cooking much and I’m embarrassed to admit they eat an excessive amount of frozen food. I have known Kylie’s children since they were teeny little people and now they’re all grown up into lovely young adults. Kylie: I have two – my son Zac is 19 and my daughter Paris is 14. Do you both make all the sweet goodies? Brooke: We make a lot of the sweet treats. We have our awesome Jimmy churning out some great desserts for the restaurant also. We are partial to a sweet treat and we love to channel our inner Donna Hay. Our speciality is our baking and food styling. We invented an amazing biscuit called a ‘brookey-kylo’. It’s a play on the classic Monte Carlo, only this one is way too big to dunk in your cuppa. Kylie: We do make and quality control all of the display cabinet sweet treats at 360Q (part of the reason I now can’t see my toes) and any function sweet treat! Sugar is the devil but it’s really yummy too. What’s the most rewarding thing about working in hospitality? Brooke: We love to be a part of people’s special days. It’s always fantastic to see people enjoying what you’ve prepared. The other rewarding thing is the beautiful team of people I get to work with. We go through a lot together and we’re a bit protective of each other. Some of these people are dear friends – the kind you can call at 3am. Kylie: I have been so very fortunate in that my work has allowed me to travel around the world (I kind of insist that I’m needed!) with my beautiful father Barry. A challenging yet memorable function just outside London was a wedding in a tennis court clubhouse. The kitchen was the size of a laundry (standard Metricon home size) and the cooking implements were non-existent, so much so we cooked rice in a teapot for over 100 guests. Adapt and overcome they say! Stay tuned for part two of this awesome chats with our couplamums!